"All of us have a place we go to when we get in those troubles. I've got a little cave that the FBI couldn't find that I get into. I'll stay in there for two or three days. I have to wade up a Creek, and go up over a hill; and through a branch, go under a tree and go down into a cave." I received a photo in the mail on January 24th, 1990, and even before I read the letter that was wrapped around it I was intrigued. 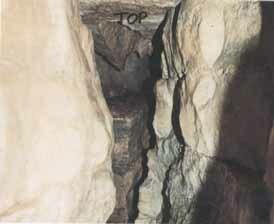 Written in ball point on one edge was the word "top", but it looked like someone had taken a picture down a well shaft. I turned it to the right: still, nothing but rocks. I love mysteries. reading the letter would be too simple, I just had to figure this out on my own. I straightened the picture, sit it on my typewriter, and started to lean back... BUT before my back ever made contact with the chair, I bolted upright. Gooseflesh was making my arms tingle. I was looking at a Sharpe-edged, pyramid-shaped rock - and a table made of stone. Fifteen miles northeast of Jeffersonville, just off Highway 62, near the city of Charleston, is a wilderness area that is known as Tunnel Mill. 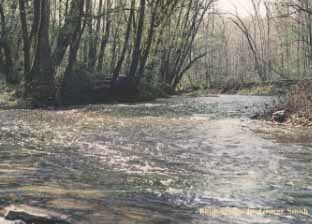 This land is hilly, and marked with large out-cropping of limestone and numerous creeks and streams. The main waterway is called Fourteen Mile Creek, and it cuts a winding path across the Charleston township from north to south, all the way to the Ohio River. The mouth of the creek is exactly fourteen miles from Jeffersonville, by way of the River, so it didn't take much imagination to come up with the name Fourteen Mile Creek. Back in the early 1800's, Charleston was known as the milling capitol of Clarke County. At that time, a man by the name of John Work operated a mill along Fourteen Mile Creek, grinding corn and wheat for the settlers and the Indians alike. In 1817, after about fifteen or so years of constant use, the old stone mill needed repairing, and that was when Work set about building the most remarkable mill in the entire state. Just downstream from the location of his old mill, Fourteen Mile Creek made a long, hairpin curve, wrapping itself around the end of a hill that rose over one hundred feet above the Creek bed. The distance 'through' the narrowest point of this peninsula of land was three hundred feet - but it was three hundred feet of solid rock. That did not deter John Work! His natural engineering talent was challenged, and he decided to dynamite 'a tunnel' through the mountain and divert the water to a new mill that he would build on the other side. Travelling through the tunnel, the water would drop a hefty twenty-four feet, enough to provide a never-failing source of power to turn his mill-wheel. It took three years for the Tunnel to be completed, but when it was finally opened in 1820, it was large enough that a man on horseback could pass through it. The new mill became famous throughout the entire state and was called "The Tunnel Mill". The ingenious John Work died in 1832, and his son became the miller and continued in the business until 1854. At that time he sold the property to Mr. Wilford Green and his family continued to operate the mill until 1927. Officially, it was still recognized as Tunnel Mill, but local people often referred to it as Green's Mill, in consideration of the new miller. Most of Green's land was purchased in 1927 by the Boy Scouts of America, and a scout camp was built near where Work's old mill once stood. The new mill was eventually torn down, leaving only the mill wheel as a rusted relic of bygone days. The incredible Tunnel was dynamited closed in 1961, when it became infested with snakes and the rangers were having a hard time keeping the young scouts away from it. We don't know exactly when my Dad (Bro. Branham) found the cave, because even as a young boy he was familiar with the area. In the winter, he would set up his trap lines along the Creek, catching beaver to help support the family. Just south of Tunnel Mill Road there was a spot called Beaver Hole. Here, Fourteen Mile Creek ran about ten feet deep. Dad and his brothers would come here to swim. The first time Dad mentioned that he went to "his cave" was in 1946, and he told how the Angel of the Lord met him there. On several other occasions, he spoke of being at the cave, sometimes for several days and nights at a time. He always went alone, except for one occasion, in 1941, when he took Mother. The only indication he ever gave as to it's general direction was when he told family members where they should stand to call him, if there was an emergency. It was at a spot about halfway between Tunnel Mill Road and Beaver Hole. Today the road signs point the way to Tunnel Mill Scout reservation, and most of the people who live nearby have no idea what you're talking about when you ask then about Green's Mill. But the old wheel is still there, and the water still runs about ten feet deep at Beaver Hole. But only the "old timers", and maybe a hundred thousand or more Believers, still call this tract of land "Green's Mill". Given my very inquisitive nature, I am amazed that I never once asked Mother to show me the location of Dad's cave. In all likelihood she wouldn't have told me anyway. Only she and Dad knew it's exact location. Mother never returned to the cave after her trip there with Dad in 1941, but here memories of that one visit were very vivid. I can recall asking her what it looked like, because in my mind I had pictured it as being only slightly smaller than Carlsbad Caverns, warm, dry and bright... "Oh no," she told me, "it's small and very cold inside." She remembered "the furniture" that Dad talked about - a rock to sit on and a ledge to lie on, and something else that was very unusual. "There was a big rock, like a pyramid, that hung from the ceiling, down over a table. It was very different." she told me. "Dear Sister Rebekah, I am sending a picture that I took at Green's Mill of a cave that I believe the Lord led me to find...When I heard that you were going to publish an album of photos about Bro. Branham, I felt to send this picture to you." I felt slightly stunned. For years, people have searched the area of Green's Mill for Brother Branham's cave. Many have spent days at a time, criss-crossing the hills and following the ravines, searching for the illusive spot that was known only to the prophet. On various occasions Dad told friends that once he was in his cave, he would pull a large bush into the opening behind him, totally obscuring the entrance from even the closest scrutiny. Often he could hear the voices of people as they passed close by, close enough that he could have reached out and touched them, had he wished to do so. As hidden as we knew it to be, and after all these years, the fact that the cave could actually be found seemed incredible. But in my hand I held a photo of what appeared to be two of the identifiable objects that I knew to exist inside the cave - the table and the incredible pyramid rock. The name of the Brother who had written the letter was not familiar to me, but I was certainly anxious to talk to him. I was, somehow, relieved to hear his soft Virginia drawl on the phone. He sounded like 'home folk' and I felt at ease talking to him. He told me the details of 'how' and 'when' he found the cave, almost three years previously. I was anxious to see the cave for myself, but it was April before George and I could take time off for the trip. We drove to Jeffersonville with our son, William, and we met Brother "C" for the first time on the morning of Easter Sunday. I couldn't wait any longer to see the cave, so we drove straight out towards Charleston. It had rained most of the day on Saturday, but that morning the skies were clear. I was feeling a great deal of apprehension by the time we reached Green's Mill, because I knew it wasn't going to be an easy walk to reach the cave. I was right. Last fall's leaves, still damp from rain the day before, made the steep hillsides treacherous. Soon I was crawling up one side of a hill, and sliding down the other side. Then we came to a place where we all had to watch out footing. We had come around the side of a hill and were looking down into a ravine about eighty feet deep. the only place to go from here was across the face of a cliff. I didn't try to keep up with the others. I went slowly, holding on to the trees for dear life, and watching carefully where I placed my feet. The area was very rocky, and huge boulders lined the bottom of the ravine. Brother "C" and William were about fifteen feet in front of me, and I looked up to see that they had stopped and were facing in my direction. I thought they were going to tease me for being so slow, then I saw they were looking at the ground in front of them. I knew they were at the cave. It doesn't look like a cave. It looks like a den for foxes, an animal lair. Just looking at it, one wouldn't think that a man could fit in the small opening. And I don't mind telling you, that for someone who was still sort of expecting Carlsbad caverns, it was a shock. I remember thinking, "How can this possibly be it? This hole in the ground, is where the Angel of the Lord met with the Elijah-Prophet and revealed the Truths of the Scriptures?!" We stood there for a few moments without saying much. I was starting to feel shaky inside, as I realized just how privileged I was to be standing at that spot. We gathered close together around the cave opening and had a word of prayer, Then Brother "C" eased his way into the narrow opening, and George followed him. I knelt on the ground to peer inside. The men were standing in a long, narrow corridor or rock, and the air from the cave that I felt on my face was very cold. The walls were no more than about eighteen inches apart, and I heard Brother "C" say, "Where did this big rock come from? It wasn't here before." The men had flashlights, but just a few feet past the entrance there was a jog in the corridor, and they were out of my sight. They did not stay in the cave very long, and when they came out, Brother "C" told us that he felt there was even more fallen rock on the inside now then there had been three years before. I wondered at first whether or not William would go into the cave, since he feels about like I do when it comes to close quarters. But, he put two candles in his pocket, shouldered the video camera, and in he went. He told me later that he didn't even think about snakes that first time, but as he was filming he did see a bright red salamander on the wall. The cave must be entered feet first, for just past the opening the floor quickly slopes downward, from a height of about three feet at the entrance, to almost seven feet a little ways inside. A Person is at least partially standing, once inside. 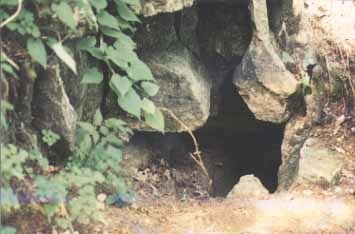 A very narrow passageway, about twenty-five feet in length, leads from the cave entrance to a small chamber at the rear. There is evidence that the chamber was once larger than it is now. Fallen rocks at the front of the chamber make it impossible to enter that area, and even reaching into that part of the cave with a camera is very difficult. It is obvious that the huge limestone blocks that form the interior of the cave are shifting. But whether it is due to rocks falling from the ceiling, or the north wall of the chamber that simply collapsed inward, we cannot tell. But, of the 'nature-formed' pieces of furniture that Brother Branham spoke of, only the table, located at the furthest corner of the cave, is still intact. The table is formed from a massive block of limestone, and the corners at the top edge are perfectly square. It measure three feet by four feet across the top, and is about three feet high. Directly over the center of the table hangs the Sharpe-edged, pyramid-shaped stone that Mother described to me. It's easy to understand why this sight stayed so vividly in her memory. The point of the stone is poised just inches above the surface of the table, as though its downward plunge was halted just a fraction of a second before it would have been destroyed. It is breathtaking. After our first trip with Brother "C", we returned several times, to make sure that every square inch of the cave that remains was thoroughly documented on tape. One interesting incident occurred on a day when I decided not to go to the cave with George and William. I waited for them three hundred feet or more back up the trail, where it was wider and I could sit down. As I sat there waiting, I decided that I would like to have a rock from the cave. I called out to George, who I could barely see, and asked him to please bring me a rock when he went back inside the cave. He couldn't hear me, but William, who was "inside" the cave video-taping, heard me clearly, and told George what I said. We are thankful that the Lord permitted us to have a glimpse of what we feel is the hidden, private cavern of the Prophet. But because of the potential danger that is present by the very unsafe trail, and the crumbling interior, we have now completely covered the entrance to the cave. Directions to it's exact location will not be given. The name of the Brother who found the cave is not being given in order to protect his privacy. We are grateful for the trust that he has placed in us by sharing the location of this special place. Go back to Brother "C"